Plate Tectonics is the study of how the surface of the Earth changes. The continents and oceans are sitting on top of huge plates, many of them thousands of miles wide. They are constantly moving, but they move very slowly, only a few inches a year at most. Over millions of years, the movement of the plates can cause oceans to close up and continents to join or separate, like in the picture below. Plate tectonics is also responsible for many mountains. As the plates crash together, sometimes they bulge up, just like a carpet that's been pushed. When the earth pushes up like that, it forms a mountain range. Our model will have several pages showing different ways plate tectonics affects the earth. The first page will introduce the topic and let the user go to all the other pages, using buttons. 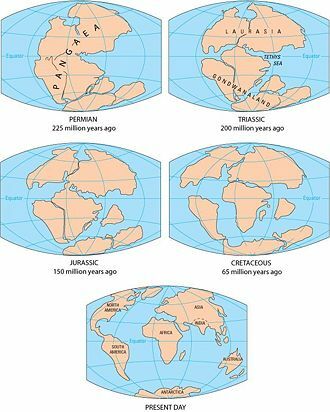 The next section will show how continents have been moving for millions of years, by playing a cartoon animation. The section after that will show two plates crashing together to form a mountain range, also using cartoon animations.